Ruth Waterman has been known for many years as an outstanding violinist, broadcaster, conductor, speaker, and educator; and more recently as an exhilarating writer and painter. Her concerts have taken her throughout the UK and US, and in Germany, France, Spain, Portugal, Netherlands, Switzerland, Italy, Israel, and Mexico among others. She has performed on BBC television at the Proms, at the Royal Festival Hall in the presence of the Queen, on New York’s Great Performers at Lincoln Center, and on Russian State Television in the galleries of the Hermitage in St Petersburg, the first British violinist to play there. Concerto appearances have been with such orchestras as the London Symphony, BBC Symphony, English Chamber and Orpheus Chamber Orchestras. 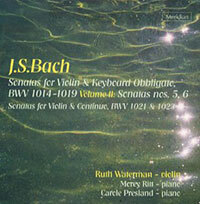 Waterman’s reputation as a revelatory Bach interpreter was cemented by her recordings of the solo Sonatas and Partitas and the complete Sonatas with Keyboard (Meridian), awarded top rating in BBC Music Magazine and Critics’ Choice in Gramophone. Originally from Leeds, Ruth Waterman gained national attention when Yehudi Menuhin invited her to substitute for Nathan Milstein in a Mozart concerto under his baton at the Bath Festival. For many years she lived in New York, where she debuted in recital in Carnegie Hall’s International Artists series. While there, she began presenting radio programmes on the issues of music interpretation, an activity which combined two of her constant interests: the process of bringing music to life, and the deepening of the listener’s experience. 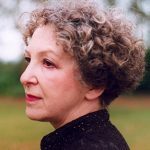 These developed into her popular lecture-recitals, Ruth Waterman Explores & Performs, which were heard on the concert platform throughout the UK as well as abroad, and featured on the cable television channel Artsworld. After returning to England, her broadcasts broadened to include a BBC Radio 4 documentary Music and Memory in Mostar, and Something Understood on Listening. Ruth Waterman has conducted orchestras in places as diverse as the Winter Palace in St Petersburg (Hermitage State Orchestra) and the ruins of Sarajevo (Mostar Sinfonietta). Her involvement with the Orpheus Chamber Orchestra led to her directing performances across the US, Europe and South America, as well as recordings for Deutsche Grammophon. Always interested in educating the next generation, Waterman was professor of music at City University of New York, and has given master classes and lectures at Juilliard, Oxford University, Royal Academy of Music, St Petersburg Conservatory, Jerusalem Academy of Music, and many more. In 2002 she was invited to conduct and teach in Bosnia, which prompted her to consider the role of music in post-war societies. This resulted in her book When Swan Lake Comes to Sarajevo, a Book-of-the-Year of the Observer. This in turn led to numerous appearances at literary festivals, including the venerable Shakespeare & Co in Paris, and she frequently speaks about music, Bosnia, listening and writing to diverse organisations. As a poet, she has been published in many journals and was a recent prize-winner of the Troubadour International Poetry Competition. By no means a prodigy, Waterman grew up in Leeds surrounded by music, her father playing the violin, her mother the piano, her elder sister the piano, and her brother the cello. She herself learned both the piano and violin from the age of five from her parents, deciding when she was twelve to focus on the violin. She studied at the Royal Northern College of Music from the age of nine with Hungarian violinists Endre Wolf and György Pauk. She first came to national attention when Yehudi Menuhin invited her to play for him on a televised master class, in which she played the Beethoven Concerto. This was quickly followed by winning a prize in the first BBC Violin Competition, which led to many concerto broadcasts. At this point, her burgeoning concert schedule forced the reluctant decision to forgo a place at Cambridge University, where she had won a scholarship to study economics. By the following year, she had been decisively propelled into the limelight when she substituted at short notice for Nathan Milstein at the Bath Festival, playing a Mozart Concerto under the baton of Yehudi Menuhin. Although Waterman was now recognised as one of the leading young violinists in England, she chose to continue her studies by going to New York, where her teachers were Ivan Galamian, Paul Makanovitsky, Dorothy DeLay and Paul Winter. After graduating from the Juilliard School, she complemented her solo work with many different kinds of music-making, from chamber music to orchestral leading to jazz. This exposure to a vast array of musical styles and musicians proved an enriching and broadening impetus to her development as an artist. She ended up staying in New York for over twenty years before settling in London. Meanwhile, her New York debut was given with Rosalyn Tureck before a huge audience in Central Park, followed by a recital in Carnegie Hall’s International Artists series. Her interest in Bach was already simmering by this time, and she was embarking on her long search for a performing style by attending Baroque dance classes with the dance historian Wendy Hilton, and researching the issues of historical performance practice. 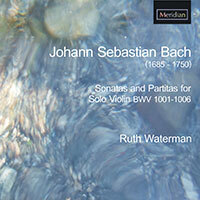 Waterman’s distinguished reputation as a revelatory Bach interpreter was confirmed by her recordings of the complete Sonatas with Keyboard (Meridian), winner of Critics’ Choice in Gramophone, and hailed as “by far the best violin/piano version ever recorded” by American Record Review; and of her unanimously acclaimed solo Sonatas and Partitas (also Meridan). Throughout her career, her all-Bach programmes have been much in demand, from Wigmore Hall to Avery Fisher Hall to the Aldeburgh Festival (at the personal invitation of Benjamin Britten). She applies the same rigour and commitment to the music of all composers, her repertoire encompassing everything from Mozart to Elgar to Gershwin to Stravinsky. She frequently performs the complete sonata cycles of Bach, Beethoven, Schubert and Schumann, and loves to resurrect works that are out-of-print and out-of-favour. Concerto performances have been with such orchestras as the London Symphony, BBC Symphony, English Chamber and Orpheus Chamber Orchestras. She has performed on BBC television at the Proms, at the Royal Festival Hall where she was once presented to the Queen, on Great Performers at Lincoln Center, and on Russian State Television in the galleries of the Hermitage in St Petersburg, the first British violinist to play there. She has appeared not only throughout the UK and US, but also in Germany, France, Spain, Portugal, Netherlands, Switzerland, Italy and Israel, among others. She delights in putting together unusual and stimulating recital programmes and has played with such distinguished pianists as Richard Goode, Michel Dalberto, Ruth Laredo and Artur Balsam, as well as other musicians like Elly Ameling, Peter Schreier, and Tabea Zimmermann. Ruth Waterman broadcasts frequently on radio stations in many countries, and she has presented several talks on the BBC. During her years in New York, she became fascinated by the idea of communicating to audiences some of the issues that engage musicians in their work on interpretation. So in 1988, she began presenting a radio programme on WNYC on The Art of the Performer, which developed into her special presentations, Ruth Waterman Explores & Performs. These have been presented on the concert platform by Wigmore Hall and Lincoln Center’s Mostly Mozart Festival, as well as in France, Germany, Israel and Russia. They have also been featured in a programme on the cable television channel Artsworld. Waterman’s interest in education has also been directed towards the next generation of musicians. She has taught at the Royal Academy of Music and was professor at Queens College, City University of New York, where in addition to violin and chamber music, she devised and taught courses in repertoire and performance style. After a few years, her educational initiative was given full rein when she was appointed director of the summer chamber music programme. Now she frequently gives master classes and seminars during her travels, teaching at Juilliard, Oxford University (Wolfson College Lectures), St Petersburg Conservatory, Jerusalem Academy of Music, Royal Northern College of Music, New England Conservatory and many more. Since returning to England, her activities have branched out in new directions. She has turned her hand to conducting, one of her first engagements being with the Hermitage State Orchestra in St Petersburg’s Hermitage in their series only Mozart. She regularly conducts the Mostar Sinfonietta, a relationship that began in 2002 when she volunteered to go to Mostar, Bosnia. Her audio diary of her initial visit, together with recordings of her interviews with the musicians about their experiences during the war, were made into a documentary for BBC Radio 4, Music and Memory in Mostar, which she wrote and presented. Ruth Waterman has always enjoyed the written word, often writing her own programme notes as well as articles about music (BBC Music Magazine, the Strad, Classical Music, American String Teacher). Her experiences in Bosnia prompted her to consider the role of music in post-war societies, which resulted in her book When Swan Lake Comes to Sarajevo (Canterbury Press). This was selected as a Book-of-the-Year in the Observer, and has led to appearances at many literary festivals including the venerable Shakespeare & Company in Paris. As a poet, she has been published in many journals and was a recent prize-winner of the Troubadour International Poetry Competition. A marvellous performance … played by a deeply admired artist. Waterman’s profound understanding of the essential continuity of thought in each of the movements of these works is well-nigh perfect … I have no hesitation in saying that … anyone who cares about great music should acquire this release. Everything here is deeply felt, the product of a profound engagement with the music, as Waterman’s own detailed booklet-notes make clear … Her creativity extends to elaborate decoration of the repeats in several movements. More like variations than improvised ornaments, they demonstrate her thorough absorption of Bach’s idioms. There’s so much here that’s stimulating and thought-provoking … a powerfully memorable performance. Arresting and imaginative … obviously the culmination of years of exploration, it’s lived-in, it’s carefully considered, yet spontaneous-sounding, improvisatory, vital and startlingly effective. By far the best violin/piano version ever recorded. She dances with grace and poise at any tempo. No-one catches better the jazzy – nay, the downright Carterish – polymeters in the last movement of the C-minor Sonata. Nor does anyone sustain better the endless Italianate arcs in the Adagios, where her every thirty-second and sixty-fourth knows its place and the big line emerges with effortless clarity … I have never heard the many passages in double stops including whole movements, like the Adagio of no.5, better in tune. They leave nothing to be desired. She knows that ornaments are meant not only to embellish but to add to expression. Hers sometimes bite, sometimes caress, and sometimes (as in the middle of the finale of no.6) shout, “Whee!” In short, these are instinctive, exuberant, visceral performances by someone with a complete standard technique (just listen to her thrilling bariolage in the second movement of no.2), but whose musicality and taste are far above the standard, and whose terpsichorean rhythm is of the elect … Waterman is an experience no Bach-lover should miss. 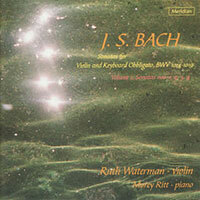 Violinist Ruth Waterman has a particular affinity with Bach’s sublime sonatas for violin and obbligato keyboard: she has given talks and written about them, but above all communicates her obvious insight through these eloquent accounts. … deeply affectionate and affecting performances. Her playing speaks of total love and involvement from beginning to end. The eloquently controlled warmth of emotion with which she spins out melodies such as the opening Adagio or the haunting largo of the C-minor Sonata is enough on its own to make one want to forget life’s troubles and lose oneself humbly in Bach’s unique genius. These thoughtful and finely nuanced Bach sonata readings entirely fulfil the high expectations raised by the first instalment … [which] bespoke nothing less than the utmost care and forethought. “Churned out” they certainly were not. The follow-up, offering the last two obbligato sonatas plus the two alternative movements for Sonata no.6 and the two sonatas for violin and continuo, is no less lovingly prepared. All the elements that were so enjoyable in that movingly sculpted release are present here too: the intensely felt but never heavy-handed lyricism; the lithe, rhythmic buoyancy in faster movements, the meticulous attention to local details of dynamic and articulation; and the long-range shaping created by involving crescendos and diminuendos, sometimes extending with outstanding success over a sequence of movements, as in Sonata no.6’s progression from the surprisingly subdued solo keyboard third-movement Allegro, through the halting phrases of the Adagio to the measured but steadily mounting joyousness of the final Allegro. The texture is always clear, with the piano a full partner in the balance, and vibrato is used just enough to warm the tone… This is very fine Bach-playing. The sense of stillness and concentration in movements such as the Adagio of Sonata no.5 is unforgettable. Waterman communicates thorough joy in her fiddling, whether in super-charged moto perpetuos or in probing introspection. Supremely exuberant. The Andante movement brought this large, rapt audience very near to tears. The playing was full of small beauties and innocent passion. Schubert would have been pleased. The large audience was eating out of her hand… Waterman’s delight in Beethoven’s quirkiness, his capacity to surprise, challenge and animate, proved infectious and involving… Bridges were being built. A master interpreter … triumphant performance. Most violinists would give their eye-teeth for the kind of legato that flows so effortlessly from Ruth Waterman’s instrument.